WASHINGTON (AP) — President Donald Trump took to Twitter on Sunday to unload on James Comey over his forthcoming memoir, calling him "slippery," suggesting he should be in jail and labeling him "the WORST FBI Director in history, by far!" Trump fired off a series of tweets ahead of Comey's first interview on the book, which offers his version of the events surrounding his firing as FBI director by Trump and the investigations into Russian election meddling and Hillary Clinton's email practices. The interview will air Sunday night on ABC. Comey's disclosure shortly before the election that the FBI had reopened its investigation into her email use enraged Democrats. After Clinton's loss, many Democrats blamed Comey, and Clinton herself has said it hurt her election prospects. Trump on Sunday pushed back again against Comey's claims that Trump sought his loyalty, saying, "I hardly even knew this guy. Just another of his many lies." 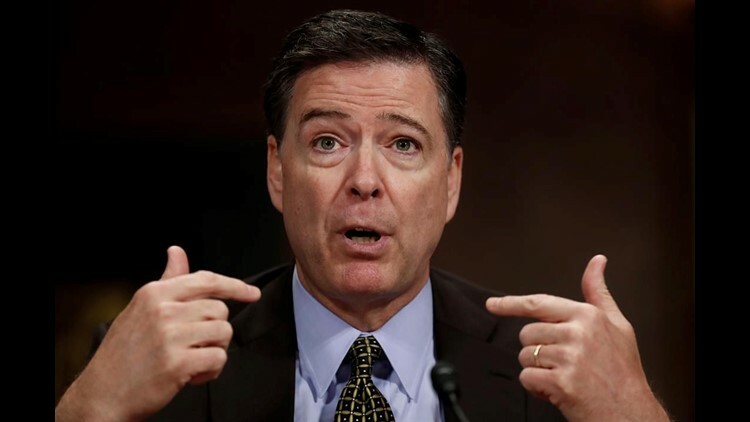 He questioned Comey's intelligence and place in history, writing, "Slippery James Comey, a man who always ends up badly and out of whack (he is not smart! ), will go down as the WORST FBI Director in history, by far!" Trump fired Comey in May 2017, setting off a scramble at the Justice Department that led to the appointment of Robert Mueller as special counsel overseeing the Russia investigation. Mueller's probe has expanded to include whether Trump obstructed justice by firing Comey. In the interview excerpt released Saturday, Comey said he did not remember "consciously thinking" about the election results as he decided to disclose that the FBI had reopened its investigation into candidate Clinton's email use. But, he acknowledged, "I was operating in a world where Hillary Clinton was going to beat Donald Trump, and so I'm sure that it was a factor." "3 presidents are in my book: 2 help illustrate the values at the heart of ethical leadership; 1 serves as a counterpoint," he wrote. "I hope folks read the whole thing and find it useful."